With Elite Athletes, establishing and refining processes are vital to their success – it's an important step to honing and tracking progress. 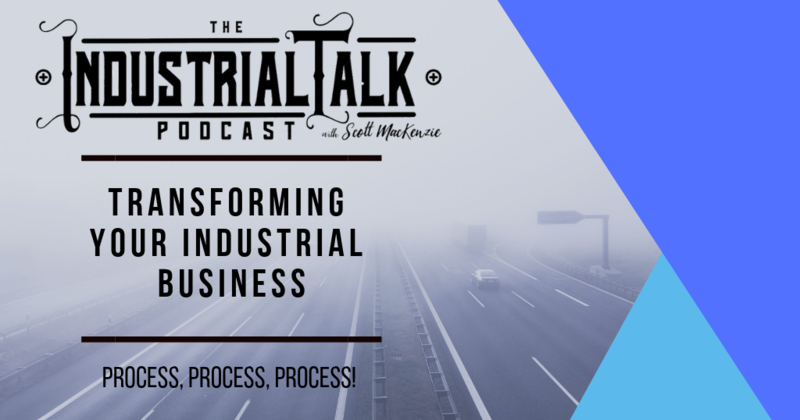 In this Industrial Talk Podcast we discuss the importance of Elite Industrial Professionals to establish and refine Business Processes and making this effort a Top Priority for Success. [00:01] The industrial talk podcast GO-BIG in just six minutes a day. Building a legacy of success in a rapidly changing industrial market. All right, welcome to the industry to talk podcast, so glad that you are here. Thank you very much for joining. My name is Scott MacKenzie. Let's get going. We're going to be talking about process. [00:19] Yes, Oh yeah, process, but before we get going, let's talk about that industrial grade toolbox. We've got two boxes and solutions, industrial grade and we want to make sure that you're looking at ActiveCampaigns, CRM. You need that for your email marketing BombBomb. That is that video email solution that brings out that human side of you and then Social Jukebox. Do more with less, be able to post to be effective at that. Social Jukebox is a great and powerful tool and then because we're about 100, 100% about your success, the content on this platform, the industrial talk platform is all about education to a Industrial Academy and the Industrial Dojo. Both are located out on Industrial Talk.com. Go around, get that information, continue to feed yourself with education because it's real important so that you definitely can be a success. Okay. This is a topic that is so important to me. [01:24] It is something that I have done for my entire 30 plus career in industry and it's always about processes, process, process, process. So let's start out with some data. And this comes from a Haploops. That's Haploose. Anyway, support business processes because what we did, first off, we've talked about that a Elite Athlete in what they do right in that podcast. And then we had another podcast talked about Grit, determination, never giving up. That's also important. Now we're going to proceed into process. Okay? Inefficient business processes have five times more impact on the customer, then the delivery of a poor product, five times poor business processes. And here's a stat for you. 52% stated their organization, their organization, your organization. My organization had never or occasionally developed performance measurements to evaluate the success or failure of business processes. [02:42] So in essence, you're just sort of the businesses in general. And I can see how this happens because businesses just grow any fall then change and whatever it does, right, they just, it happens and it's so hard to sit back and say, okay, let's, let's map out these processes and then turn those processes with some, you know, a tax document it and because it's so important because another stat here, here's a successful business process analyst and design is that understanding the business processes and business process matrix strategies and goals will provide or reduce order cash cycles. Can you believe that that's money in your pocket or reduce process costs by 10 to 15% money in your pocket. So let's talk a little bit about what we're doing about process. Okay. You're saying to yourself, man, I do not. And I mean I do not want to get into a conference room and I do not want to just start running out processes and, and just sort of sitting there. [03:51] What I'm asking you, I did another podcast and that is that is defect elimination. You can run processes on Defect Elimination. Okay, so process. So what you have is very simple is a process box with two little lines. That is your hierarchy process. That's one, two. Then you have a process box that's just two, three. You have a decision box, it's a yes or no, right? Always in a question. Do we debt to debt, question mark and then another one, one is a document looking thing. Hey, that's a document. So when you have that conversation and that's a document, you put a document there and you'd define that document and then the final one, the final one is his end. That's it. That's all it is. We get into in the industrial world, we get into this effort of just like, okay, we've got to get down this process and we got to go so granular we got to just go deep, deep, deep, and it never ever gets done. [06:34] about it. And then you'll see what I do. And you're going to say that's it, but it's the fact that you're doing it right. It's the fact that you're documenting them and it's because you want bottom line value. You don't want to create frustration for your customers. I don't, and I'll tell you I have, so you're not alone. I've been there, done that. Let's do this together. Thank you very much for joining the industrial talk podcast. We'll be back tomorrow. Have a wonderful day, evening, morning, whatever time you're listening to it. Thank you very much for joining. I appreciate it. Successful are the Humble – They know who they are.